Lord Shani Dev who is the son of Surya Dev (Sun) and Chhaya (Suvarna) is also known as one of the nine “Navagraha” by Hindu belief. Lord Shani Dev have a seventh place among these nine planets which govern our lives. Another name of Shani dev is Shanaiscarya, Asita, Saptarchi, Kruralochana, Pangu, etc. 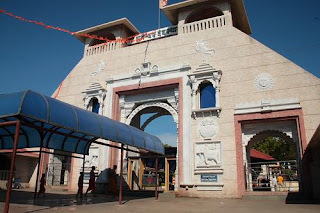 The birth place of Lord Shani Dev is Saurashtra, Gujarat. Hindu people believe that he is the god causing miseries in the life of a human being. So, Lord Shani Dev occupies the principal position among the Hindu’s God. Lord Shani Dev is the brother of Yama Dev (deity of death) and is believed to be responsible for punishing or rewarding to the people one in the lifetime in accordance with their 'karma'. He has also a power of making a king into a pauper as well as changing the fortunes of a sufferer. Shani Dev is a great devotee of Lord Shiva because Lord Shiva is Guru of Shani Dev and hence those who wish to appease him pray to Lord Shiva along with him. 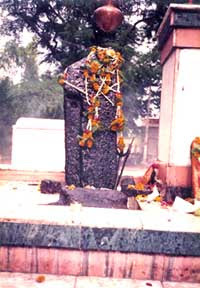 There are few shrines in India of shani Dev. 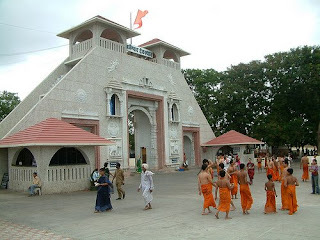 The most important ones is in Maharashtra at Shingnapur which is famous with named Shani-Shingnapur, another is Shree Sahneeshwarar at Nerul Mumbai, and Shanidham at Mehrauli Delhi, etc. In Vedic astrology, it is believed that if Shani is placed in a favorable position for you, no one can bestow more wealth and success than Lord Shani. 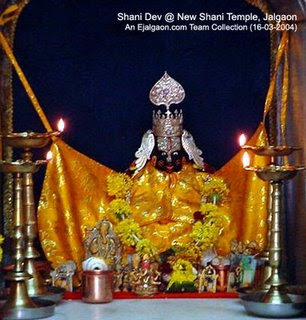 JaiJai SriShanidev Prabhu, Sunahu Vinay Maharaaj. 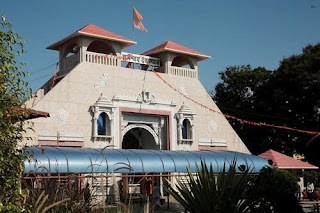 Jo pundith suyogya bulvaayi, vidhyvath shani graha shanti karayi. In Shani-Shingnapur, everyday, a lot of devotees come for a Darshan of God Shani Dev from all over India & other country. On every Saturday, countless devotees come and take advantage from the Darshan. 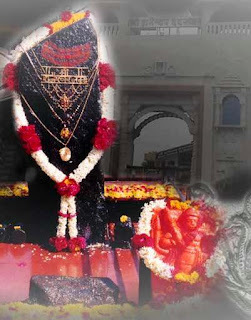 The most important festival in Shani Shingnapur is Aashadi Ekadashi, Gudi Padava, Shani Jayanti, Shani Amavasya etc. In 1991 AD one festival was started i.e. “Aashadi Ekadashi”. Then, Aashadi Ekadashi of every year, from Shani Shingnapur to Pandharpur, Shaneshwar Palkhi (palanquin) is taken on foot with great celebration. All the trustees’ member and devotees are participate in this Yatra. In Maharastra, Gudi Padava is celebrated as the New Year day by Maharashtrians. 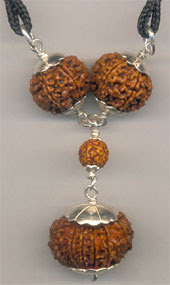 Another name of Gudi Padava is ‘Chaitra Shukla Pratipada’. Gudi Padava is celebrated on the first day of the Chaitra month of the Indian Calendar. So, devotees seeking relief from their woes, seek to take the ‘Darshan’ of God Shani Dev on this day. This festival is celebrated In Shani Shingnapur village also. 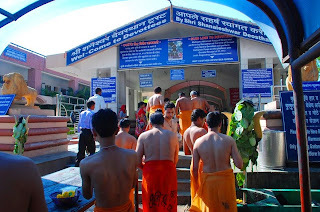 The ‘Ganga Jal’ (holy water) is brought by the devotees of the Shingnapur village in pots on bare foot. At least one person from every household participates in this festival. After bringing the Ganga Jal, the devotees stop outside the village. Next morning, they collect grain & with the flag and chanting the devotees are brought into the village. 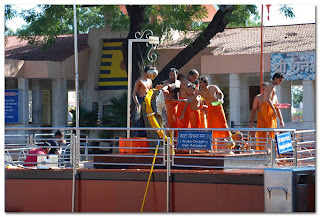 Then God Shani is bathed in the ‘Ganga Jal’. While bathing no body is allowed to step on the temple. 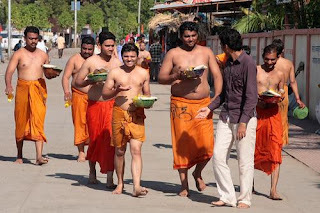 After this, those seeking vows present the prasad to other devotees. Shani Jayanti is considered as the birth day of God Shanidev. 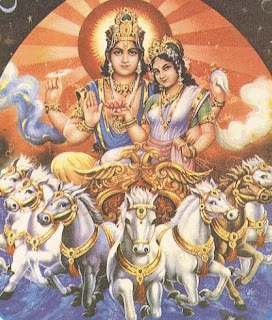 This day comes on Vaishak Vadya Chaturdasi Amavasya (In May Month). In Shani Shingnapur, Shri Shaneshchar Jayanti is celebrated with great gusto and devotion. On this Great occasion, the god appears blue in colour and seven days of ‘bhajan- pravachan’ and ‘kirtan’ and Five days of ‘yagya (homa)’ are also held in the sweltering heat of May. On this day, The “Laghurudraabhishekh” is performed by resident priest (pandit). This abhishekh goes on for 12 hours. With the ‘Maha Puja’, the function comes to an end. 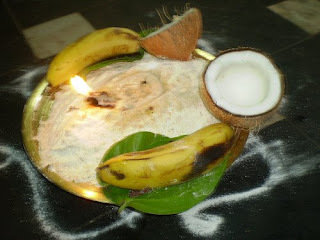 In the beginning of day, the deity is cleaned with Panchamrut, Gangajal, oil and water from the wells near by the deity. 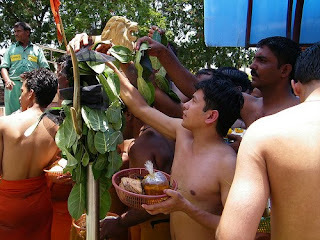 After the bath, the ‘Nauratnahaar’ is placed on the idol. On this day, Shani yagya is conducted by those people who have the Saturn/Shani cycle or Sade sathi in their horoscope. Many believe that Saturn cycle can be a reason for the bad patch in their life and also say that worshipping Shani on Shani jayanti rids one of all troubles and suffering. Generally, the devotees can perform pooja and abhishek on any day at any time in Shani Shingnapur. But the Shani Amavasya which falls on a Saturday is considered to be most auspicious. On this day, a lot of devotees from all over the country come to receive blessings of God Shani Dev. 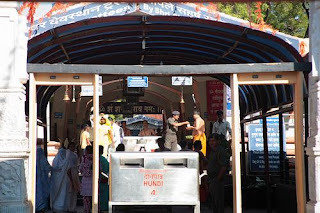 In Shani Shingnapur, Lodging and boarding arrangement of devotees are available on this day. In a whole year, there will be minimum two or maximum three Shani Amavasya. On this great occasion of Shani Amavasya, there will be arrangements for the festival in Shani Shingnapur. From the mid- night of the Friday to the mid-night of the Saturday, prayers, offerings and abhishek of shanidev will be held. 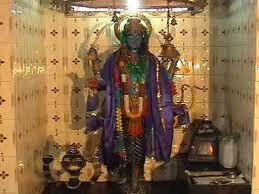 In the Shani temple, a ‘Mahapuja’ will be held. In this day, nearly 8 to 10 lakh people come within 24 hours. This Shani Amavasya is known to give good result to all religions. In India, Darshan and Prasad of God are available at almost all Hindu temples on request. The Prasad are distributed to all devotees coming out after darshan of Shani Dev. Prasad of God Shani dev is available everyday for devotees in Prasadalay Building of Shani Shingnapur Trust. The prasadam timing is given below. In Shani Shingnapur, You have to pay Rs.10/- for Prasad of God Shani Dev. This charge is only for one person. You can take Prasad from outside of temple also. Did you build this web site yourself? Please reply back as I'm hoping to create my very own website and would love to find out where you got this from or just what the theme is named. Appreciate it!